One of my heroines in the field of epigenetics is Edith Heard. In this post I will tell you what I learned from her over the years with regard to epigenetic facts and fantasies. (For a good overview of facts and fantasies, watch this video at ‘Cracked Science’). Before I do that, you might want to know who she is. “Edith Heard (born 1965) FRS is a British researcher in epigenetics. She is a Professor at the Collège de France, holding the Chair of Epigenetics and Cellular Memory, and since 2010 has been Director of the Genetics and Developmental Biology department at the Curie Institute (Paris), France. Since January 2019, she is the Director General of the European Molecular Biology Laboratory (EMBL).” (Wikipedia, accessed 3 April, 2019; here is also an EMBL podcast). I first came across her work when reading a Guardian article in 2013. So, as long ago as 2013, when I started to wake up to epigenetics, Heard was already trying to save the field’s reputation. It did not quite work, as epigenetics today is still submerged by waves of pseudo-epigenetic woo… – which makes public understanding, science communication and public engagement difficult. Shortly afterwards, in 2014, Heard and Robert Martienssen wrote an article for Cell entitled “Transgenerational Epigenetic Inheritance: Myths and Mechanisms”. This was, I think, intended to counter a lot of fantasies emerging around the meme of transgenerational epigenetic inheritance. The article sets out very clearly the possibilities and impossibilities of epigenetic inheritance, distinguishes between inter- and transgenerational inheritance and between epigenetic inheritance and germline reprogramming and more. This is quite complicated stuff!! In their conclusion, the authors point out that “in some animals such as nematodes, transgenerational epigenetic inheritance is well documented and relatively common” – that is not the case for humans. They stress that “environmentally induced epigenetic changes are rarely transgenerationally inherited, let alone adaptive, even in plants”. Most importantly they make clear that: “although much attention has been drawn to the potential implications of transgenerational inheritance for human health, so far there is little support”. So: we have some facts, but we must beware of fantasising beyond them, especially when trying to translate what we know into something we can use in health care and also social care. Just recently I came across Heard’s work again in an interview after her appointment as Director General of EMB (European Molecular Biology Laboratory). This is important: On the one hand we have fantasies or, in French, ‘fantasmes’, and on the other hand we have fundamental science. Epigenetics is still at the fundamental stage. This means that fantastic expectations lead to frustration for both science and society. As sociologists of expectation have shown, hopes and expectation “mobilize the future into the present” (Brown et al., 2013). That’s fine. But what happens when this mobilisation comes too early (Juengst et al., 2014) in the development of a science? It can’t be good for science and society. Who is responsible for this premature creation of hopes, promises, fantasies and expectations? I think in the case of epigenetics it’s advertisers and academics. By academics I mean prominent ‘champions’ (Tolwinski, 2013) of epigenetics in the natural and social sciences, some of whom come across as rather ‘ostentatious’ (Pickersgill, 2016). By advertisers I mean promoters of ‘epigenetic’ products ranging from face-cream to food. Advertisers create mainly positive expectations (‘you can control your genes!’), while some academics also create negative expectations (Joly et al., 2016), such as epigenetics heralding the return of eugenics. Creating (ethical) expectations based on extrapolation rather than reality has ethical implications (Huang and King, 2018; Dubois et al., 2018). As one epigeneticist said: “if you were to ask me, what the ethical problems with epigenetics are, I’d say, using rubbish data to influence people’s behaviour through pseudo-science. That’s would I would say is the big ethical risk of epigenetics” (Pickersgill, 2016: 195). All this does not mean that epigenetics is not fascinating. Edith Heard, for one (but there are many others), still studies its many facets. As she said in her 2013 Guardian interview: “I don’t want to say epigenetics isn’t exciting … [but] there’s a gap between the fact and the fantasy. Now the facts are having to catch up.” Between 2013 and 2019 fantasies have proliferated and the facts still have to catch up. With respect to cancer research and epidrugs, things are, it seems, progressing. There is a drug that works but scientists don’t quite know why. Scientists are also developing other drugs and therapies, but there is still a lot to do. I’d love to know what scientists working in epigenetics and related fields think about the relation between facts and fantasies and about the translation of basic science into health interventions. Image: Wikimedia Commons. 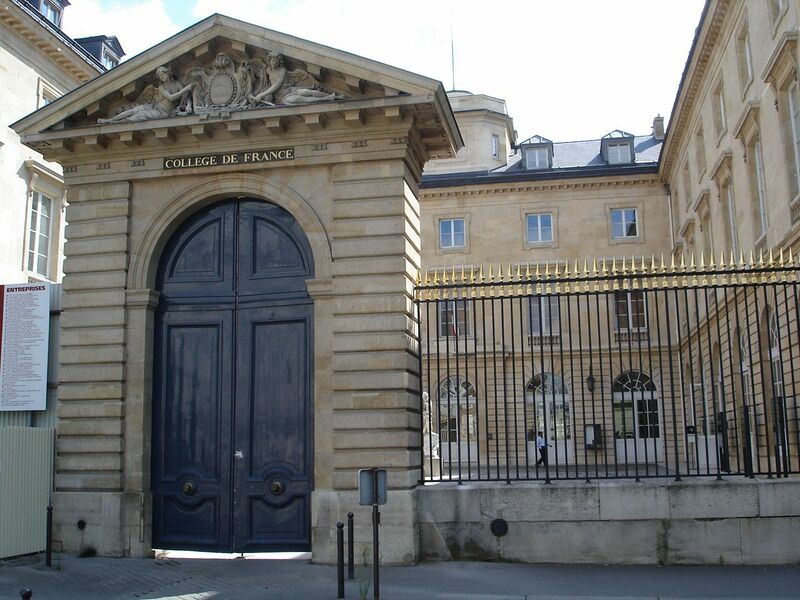 Collège de France, Paris. I chose that as a metonymy for Edith Heard, for whom I couldn’t find any images labelled ‘for reuse’.